Along with sharing an update involving investigations by state-level authorities in two locations, Credit Acceptance went through a series of year-end figures to detail its 2018 performance. 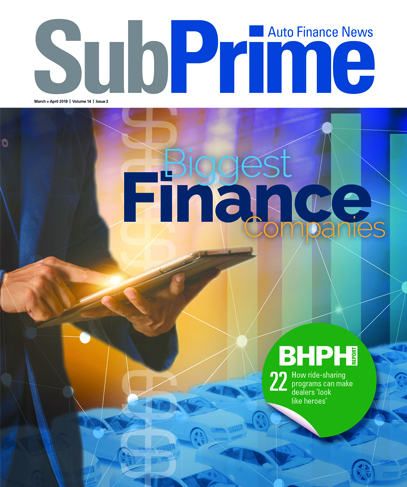 And to go with data about income and originations, the subprime auto finance company also got into the numbers attached to people — specifically its field workforce and growing dealer network. The company reported that its fourth quarter consolidated net income softened a bit year-over-year, coming in at $151.9 million, or $7.79 per diluted share. That’s down from $177.1 million, or $9.10 per diluted share, during the last quarter of 2017. However, for the year, Credit Acceptance highlighted that its consolidated net income rose to $574.0 million, or $29.39 per diluted share, up from $470.2 million, or $24.04 per diluted share, in 2017. Helping to generate those figures is Credit Acceptance’s expanded workforce. Credit Acceptance senior vice president and treasurer Doug Busk mentioned the company had about 50 more market area managers at the close of 2018 than it did a year earlier. “We’ve gone through a pretty rapid increase in the size of the sales force,” Credit Acceptance chief executive officer Brett Roberts told investment analysts who participated in the company’s latest quarterly conference call. “We’re probably at a period now where we’re filling in. “I think the last time we did a sales force expansion, it was 2011,” Roberts continued. “We grew the sales force pretty rapidly over a mostly one-year period, but followed that with a second year of some growth. It took us about five years to fill in that sales force before we got productivity back to where we started. So we’re now two years and one quarter into this expansion. “We’ve probably reached the number that’s pretty close to the target number in terms of the maximum number that we want in this expansion, and now we’re probably in that two - to three-year period where we’re trying to fill in and get productivity back to where it was,” he went on to say. That sales force is enjoying some notable productivity as Credit Acceptance shared that it finished 2018 with 12,528 active dealers in its origination network, representing an 8.5-percent lift year-over-year. The company defines its active dealers are operators who have received funding for at least one consumer loan during the reporting period. Those dealers worked with Credit Acceptance to book 373,329 retail installment contracts in 2018, marking a 13.6-percent rise from the 2017 figure of 328,507. And Roberts discussed where Credit Acceptance is carving out a bigger piece of the dealer world, flipping independent dealerships that might have had their own related finance company and operated as a buy-here, pay-here store. “That market has always been a good source of business for us. I think our program has a lot of advantages over a typical buy-here, pay-here program,” Roberts told investors. “Advantages for the consumer in particular because they can reestablish their credit on our program. We report to the credit bureaus. They can move on and get a newer, nicer vehicle at a lower interest rate, reestablish their credit, move their life in a positive direction. So there’s a lot of benefits to our program. “The buy-here, pay-here market is large, and we’ve historically had pretty good success enrolling those former buy-here, pay-here dealers in our program, so that hasn’t changed,” he continued. “We’re having good success signing up dealers,” Roberts added. In a separate filing with the Securities and Exchange Commission, Credit Acceptance relayed updates on where the company stands on two fronts. Back on Aug. 14, 2017, the company recapped that it received a subpoena from the Mississippi attorney general, relating to the origination and collection of non-prime installment contracts in the state. “In connection with this inquiry, we have been informed by representatives of the attorney general’s office that it believes that the company may have engaged in unfair and deceptive acts or practices relating to the origination and collection of auto loans in violation of the Mississippi Consumer Protection Act,” company officials said in the SEC paperwork. “We are cooperating with the inquiry and cannot predict the eventual scope, duration or outcome at this time. As a result, we are unable to estimate the reasonably possible loss or range of reasonably possible loss arising from this investigation,” they continued. An even older matter also was included in Credit Acceptance’s SEC filing. The company first received a civil investigative demand from Massachusetts attorney general on Dec. 4, 2014 relating to the origination and collection of non-prime contract. And then on Nov. 20, 2017, the Massachusetts AG sent a second civil investigation demand to Credit Acceptance seeking updated information on its original civil investigation demand, additional information related to the company’s origination and collection of contracts and information regarding securitization activities. “In connection with this inquiry, we were informed by representatives of the office of the attorney general that it believes that the company may have engaged in unfair and deceptive acts or practices related to the origination and collection of auto loans, which may have caused some of the company’s representations and warranties contained in securitization documents to be inaccurate,” Credit Acceptance said. “The investigation relating to the origination, collection and securitization of non-prime auto loans and securities transactions by the office of the attorney general remains ongoing,” the company continued.